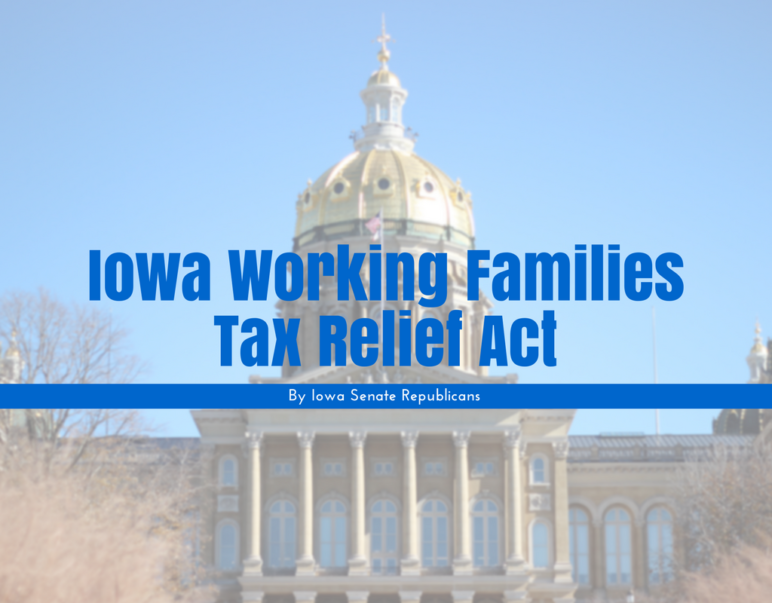 Iowa Working Families Tax Relief Act is a bold initiative that will enact the largest tax cut in Iowa history. This plan completely rewrites Iowa’s complex tax code. Over the years Iowa’s tax code has become a collection of tax deductions, exemptions, and credits standing in the way of economic growth, job creation and Iowa family priorities. Senate File 2383 sets competitive tax rates that will drive Iowa’s economic growth initiatives, making Iowa known as one of the most tax friendly states in the nation. For years, Senate Republicans had been calling for change in the Iowa Senate, and for legislation and reforms to improve career opportunities for Iowans and create an environment for stronger economic growth. The people of Iowa responded, and we were given the chance to lead, a chance to show our citizens we are more than just talking the talk. We’re here to walk the walk. Or, as many of you remember, we’re here to kick the door in. One year ago, we started our journey. We passed legislation on the Second Amendment and voter ID, a joint resolution to let the citizens of Iowa vote on putting a 99 percent expenditure limit amendment in the state’s constitution, changes to reward our state’s best teachers, and give our school districts more control and flexibility. We passed legislation reducing the regulatory burden on Iowa’s job creators and eliminated hurdles to growth for other industries, improving career opportunities for every Iowan while ensuring our state remains a beacon of enterprise and ingenuity. Here we are today, ready to write chapter two. Our state is full of motivated, ambitious and hard-working individuals – everyday Iowans who get up before the sun rises and go to bed long after the sun goes down. They are single parents who work multiple jobs to make ends meet and still find the time to help their kids with homework. They are students who work hard to learn a trade so they can find a stable career, start a family, buy a house, and join Iowa’s healthy and growing middle class. They are aspiring small business-owners who are working to turn a hobby into something a little bigger. Our goal is simple. We want our local businesses – our coffee shops, tire stores, and family diners – to grow and prosper, our communities to grow and thrive, and our children to grow up prepared to tackle the world. We want to relieve the tax burden on the people who make our state what it is, and ensure that every Iowan has the opportunity to thrive here at home. The objective has always been the same – for more money to be kept by those who earned it. Tax relief is about emboldening our middle class and encouraging our citizens to invest in themselves, their local businesses, and our state. It is about giving Iowans a little more cushion in their family budget, a little extra to put towards their student loans, or a little more towards that big family vacation. It is about growth and opportunity. As I’ve stated before, our priorities are no different than they have been in the past. We were sent here to do a job – we were elected to balance the state’s budget, foster an environment of job growth and prosperity, and enact policies that will allow teachers to give our children the education they deserve. But growth and opportunity don’t just apply to our state’s families. We are also giving our schools and school districts the tools and control to adapt, to innovate, and to spend taxpayer dollars doing what’s right for the students in their community. While we will again tackle a difficult budget, we will keep our promises to create a better environment for job growth in our state, provide our children with an education that ensures competitiveness both at home and abroad, and ensure everyday, hard-working Iowans get to keep more money in their pocket. In 2017 our agenda was big and bold. In 2018, Senate Republicans will move an agenda that will again be big and bold because this state deserves big and bold. The changes we make will move our state forward in a positive direction, felt for many generations to come. The success of our time here should not be measured in how many dollars were spent, or how many dollars saved. Success is determined by how many opportunities that can be created, businesses that can start, and families that stay here in Iowa and continue to call it home for generations to come. Good morning! Majority Leader Dix, Minority Leader Petersen, Senators, staff, family and friends welcome to the Iowa Senate as we begin the 2018 Legislative Session of the 87th General Assembly. Colleagues, thank you again for the honor to serve as president of the Iowa Senate! The first day of the legislative session is one of my favorites as a legislator. Optimism runs high, and there are smiles and laughter heard throughout the Chamber as we reconnect with friends and colleagues. More importantly, 50 senators unite in this Chamber with promising new ideas on how we will shape the future of Iowa. I have never been more optimistic about what lies ahead for our state. People around the country are taking notice of Iowa. In just the last year, Iowa has been recognized for our great job climate – being named the BEST state in the country for the middle class. Our schools have also been recognized as we were named the #1 state in America in high school graduation rates and #4 in increased education funding. Our state has been recognized as the 3rd best managed state in America. There are so many reasons to be excited about the future. I have no doubt that our best days lie ahead of us! As we embark on the 2018 session, I look forward to building on what many have said was the most historic session this body has ever seen. I am proud this legislature has maintained a great vision for the future, working on issues which will have a profound impact on our state for years to come. One of my personal highlights last year was bringing my children to spend a day at the Capitol. They joined us in the pledge of allegiance, watched debate, and enjoyed meeting many of you. I know they had a blast as they often ask when they can come back to visit this session. However, as much fun as they had and the lessons they took away from the Capitol, it pales in comparison to what I gained from it. When things get hectic at the Capitol, big picture thinking can become blurred. It is imperative we do not lose sight of why we are here. My children remind me why I serve; and, I am guessing it is the same reason all of you serve. We inherited a great state from our parents. It is our job to ensure our kids and our grandkids inherit an even better state from us. We must work diligently on behalf of the next generation so they have opportunities and experiences even greater than our own. We want all Iowans to live in safe communities. Each one of us strives for Iowa children to receive a world class education and prepare them for work in a global economy. We want our young adults to stay in Iowa – not only for our great career opportunities, but for our outstanding quality of life. And just as important, we want our retirees to stay in Iowa to be close to their families and remain active members in their communities. While my optimism for our future is great, the challenges of today still exist. We need to work together to ensure Iowans have access to affordable healthcare, enhance our mental health system, improve our water quality, develop a skilled workforce and continue to revitalize rural Iowa. In order to accomplish these goals and fund any initiatives, we must always continue to strive for growth in the state of Iowa. This requires more than reducing regulations or adjusting the language in the Iowa Code. It is being open-minded to bold ideas; and having the courage to lead to make that vision a reality. Two courageous leaders of this nation earned the respect of their fellow Americans during their presidency – John F. Kennedy and Ronald Reagan. Both were visionaries, who shared a common belief that growth resulted from reducing taxes. I share this belief and challenge the body to act bold in passing tax reform in the state of Iowa for the first time in over 20 years! The question we must ask ourselves is do we want to succeed and remain in the top run states in the nation, or be complacent and let down the three million Iowans who are looking to us to lead? We have a choice on which path we forge: One that moves us forward and focuses on economic growth and security for our future generations, or the other which takes us a step backward – slowing economic prosperity and progress. Progress to me is measurable: low unemployment rates, job creation, revenue growth, more disposable income and lower tax rates. I am confident we all want to see this kind of progress for Iowa, and this can be achieved if we have the courage to act boldly. Like Kennedy and Reagan, let us choose a path of growth and prosperity. Let’s continue to look beyond the next election, and look to the next generation as we ensure the 2018 session is even more historic than 2017. It is just over a month away from the start of the 2018 legislative session. During these last couple months, I have been spending a lot of time working on the farm, listening to ideas from friends and neighbors, and getting feedback on the last legislative session. The 2018 session will be the second session of the 87th General Assembly. In the first, we accomplished a number of the goals we promised you in the election – the very reason you elected us to the majority in the first place. These achievements included huge legislation on the Second Amendment and voter ID, a joint resolution to let the citizens of Iowa vote on putting a 99 percent expenditure limit amendment to the Iowa Constitution, and collective bargaining reform to reward the best teachers our state has to offer. In an effort to improve career opportunities for Iowans, we passed legislation reducing the regulatory burden on Iowa’s job creators and eliminated hurdles to growth for other industries. We have only just started to see the rewards these changes have made for our state. While we will again tackle a difficult budget, I know we will continue keeping our promises to you to create a better environment for job growth in our state, give our kids the education they deserve, and ensure everyday, hard-working Iowans get to keep more money in their pocket.